Full color PDF with large charts. 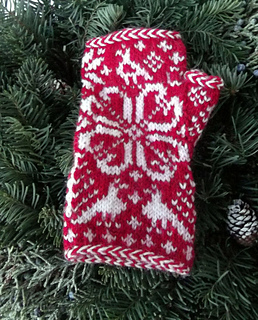 Also available as part of Winter Wonderland Knits. 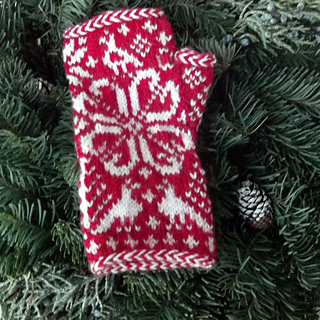 Delicate birds flock amongst pine trees and snowflakes speckle the background in these tantalizing winter themed fingerless mittens. 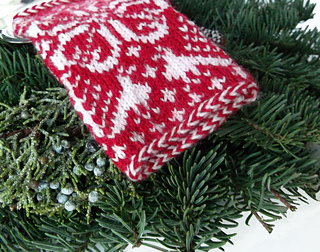 Purl braids and a thumb gusset with a tree pattern add interest and charm to the traditional Fair Isle inspired motifs. The chart includes all colorwork rows, and instructions are included for working a purl braid. Women’s size medium. Finished size 7 inches around and 7 inches long after blocking. Thumb opening up to 2 ¼ inches around.